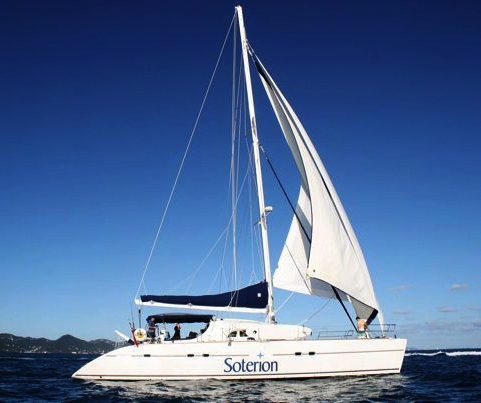 Catamaran Soterion is a 2001, 57’ Lagoon catamaran offering crewed yacht charters in the BVI and USVI. 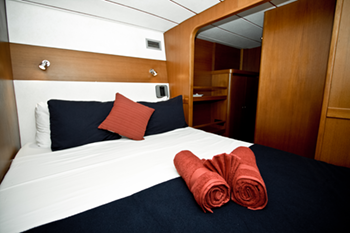 She features accommodations for up to 8 guests in 2 Queen cabins and 2 tapered Queen cabins. 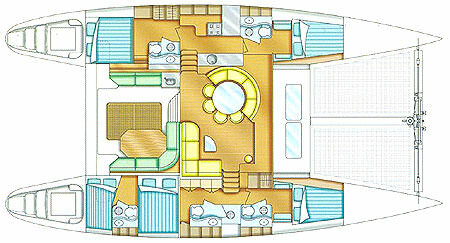 Catamaran Soterion is a Carefree Yacht Charters affordable pick for families, couples, foodies, and special occasions. 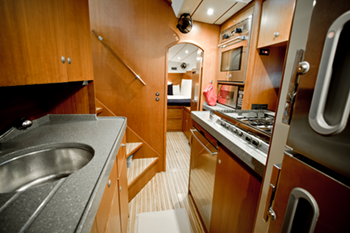 Here's what Ben & Rachel told Carefree Yacht Charters about their general service style aboard: "When people step aboard Soterion, we want them to feel at home and at ease. Our service level is laid back, fun and flexible, but prompt and professional. Our strong suit is customization so every night after dessert we have a “family meeting” to include guests in the decision-making process about the next days events. We do not wear crew uniforms, which guests like because it seems “less stuffy”. 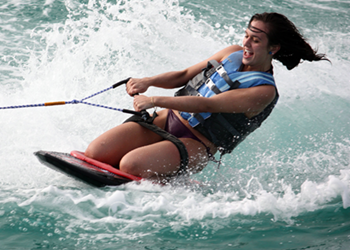 We want to be your guides to the trip of a lifetime." Rates from $18,000 to $21,000. View availability and rate details. To learn more about this crew or for further details about SOTERION, call us in our South Florida office at (954) 980-9281, toll free at (888) 670-6884 or fill out our Quick Request Form. 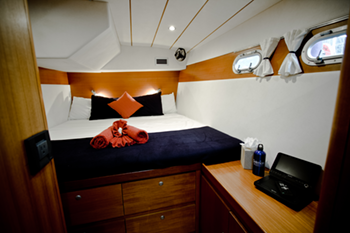 Christmas / New Years: up to 8 guests - US$23,500 USVI pick-ups / drop-offs: plus $750 Charters outside the Virgins: Regardless of whether or not a vessel may or may not include taxes in the vessel's listed charter fees for Virgin Islands charters, in general, no fees, port dues, nor taxes are included in the charter fee for any charter outside the Virgin Islands unless otherwise agreed. 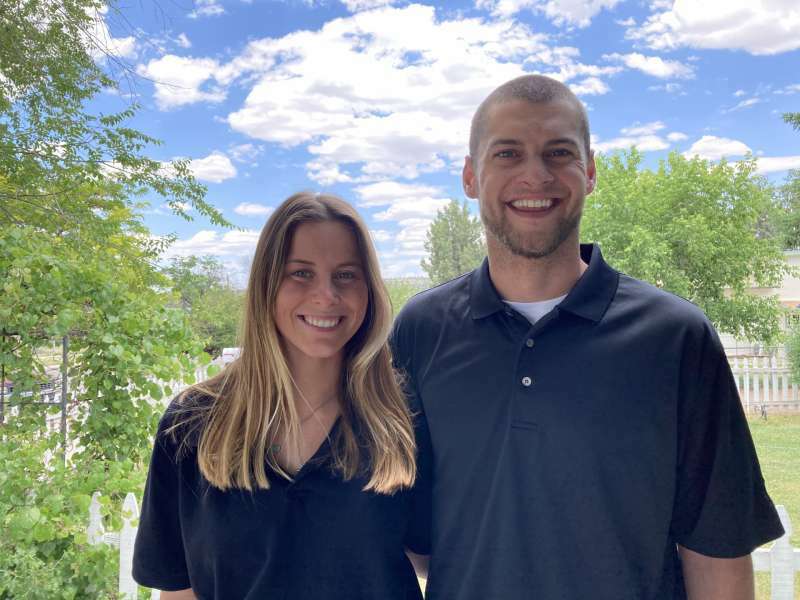 Captain Ben Raley and First Mate Rachel Haskovec are a young, energetic, professional yachting and charter host team. 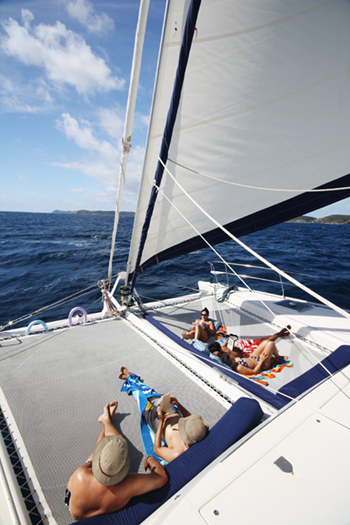 Together they have a deep passion for all of the adventures that the Virgin Islands have to offer and enjoy sharing them with others. As a couple they offer a charming graciousness that helps people to feel comfortable and fully relaxed, and work closely with every charterer to match their guests level of interest with the right level of activity, dining, and relaxation. Ben was born & raised on the Gulf of Maine, and has harbored a love of the sea his entire life. Building his first rowboat with his father at the age of six, Ben knew that the ocean was where he belonged. At eight, he started sailing aboard a Rhodes 19 and by the age of 18, he made his way from Portsmouth, NH to Hawaii via the Caribbean islands and Panama Canal aboard various sailboats. Eventually settling in Washington States Puget Sound, Ben taught sailing in a community sailing program during the summer months and apprenticing under a local shipwright in the winters. Finally aboard his own 32 sailboat, he was able to fulfill a dream of sailing back to New Hampshire. Adventures along the way to fund his dream included, working as a deckhand aboard ocean going tugboats hauling freight through Southeast Alaska, commercial fishing for giant Bluefin tuna, delivering sailboats along the west coast of Central America, and working as mate aboard a luxury charter yacht based in Petersburg, Alaska where he learned the finer points of running top quality charters. Tropical seas calling him, Ben focused his efforts on the Virgin Islands and has successfully Captained two charter catamarans based in the BVI. Ben is excited to be aboard Soterion, sailing the crystal clear waters and trade winds of the US & British Virgin Islands. Rachel was born with an adventurous spirit, and grew up hiking, camping, fishing, and eagerly exploring her love for the outdoors near her childhood home in Boulder, CO. With a degree in Business Marketing, she worked in sales for DEWALT power tools in Boston, quickly developing a passion for the ocean, enjoying swimming, SCUBA diving, sea kayaking and catching and cooking the freshest seafood. Her fascination with sailboats also started in New England, where she called on and worked with the manufacturing facilities of Hinckley Yachts in Maine and observed the construction process from start to finish of some of the finest yachts in the world. Rachel has also pursued her passion for food and entertaining, working with the Culinary Institute of Montana where winters included skiing and working in fine dining establishments while the summer months involved rock climbing, rafting, and racing sailboats on the largest natural freshwater lake in the western US. Missing the salty air & vastness of the big blue, Rachel left the US to live and work aboard a sailboat and deliver her from Florida to Bocas del Toro, Panama. Eventually spending extensive time in Central America, Rachel founded Nicaragua Energetic Flow Yoga, working as a full time traveling instructor at 6 resorts in the southwest corner of Nicaragua. She also managed and cooked at a B&B guesthouse in the jungle outside San Juan del Sur. 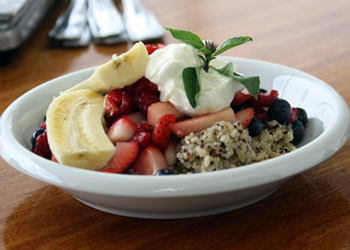 As an athlete and yogi, Rachel is adamant about using the freshest quality local ingredients to create healthy and delicious meals that feed the body and the soul. 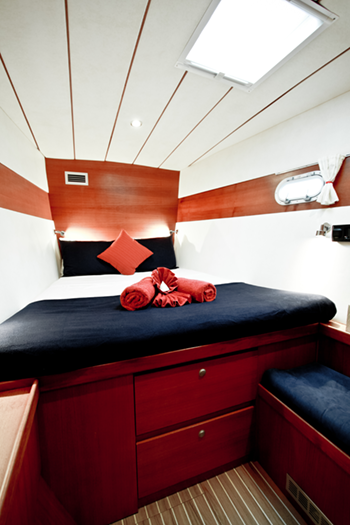 Includes four queen cabins (one of which converts to twin beds), all with en-suite showers and non-polluting LectraSan heads. I doubt we could've ever Imagined, when Don first spoke to you, we would be returning from our trip to BVIs to tell our friends we had the ultimate perfect vacation on the Soterion. We have to give a huge amount of credit to you for finding the perfect boat and matching us with Rachel and Ben, two amazing people. Thank you all. 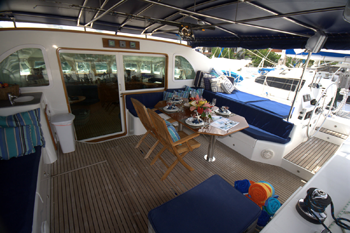 Taking siblings, spouses and grandchildren and putting them and us on a 57 foot sailboat is not always easy unless you have people like Rachel and Ben who stayed tuned into the interest and concerns of their guests. From the moment we stepped foot in the boat, they made everyone at ease and prepared us for a fun week ahead. We were definitely looking forward to the week onboard, though we did have some concerns. We had some allergy and food allergies, our youngest grandson, age 11, initially was scared of being on the boat, animals in the water, water sports; was there going to be enough to keep our older grandson, age 15 who is fearless, active and engaged; was there going to be enough for our sons 39, 42, 44; was our daughter going to be able to sit back, relax and "watch the world go" and of course, were we going to like the crew? First Rachel and Ben greeted us with a huge welcoming smile. They showed us around the boat and set some boat guidelines. I thought this was a great way to start. The size and the beauty of the boat left me speechless. I could tell right away our crew and the Soterion were a perfect match for all of us! Don and I got to sit back for a whole week and just watch our kids/grandkids having a blast. So let's start with Jordan who is 11. I was concerned he might be his at moms side for the week because he was scared of being on the boat etc. how wrong I was! Both Rachel and Ben's patience toward helping Jordan feel comfortable really paid off. Never pushing just giving a reassuring gentle nudge or educating and informing him. ie.when he caught fish or they found and an interesting sea animal, they gave him books to discover more about the animals and the Sea. We saw an amazing transformation by the end of the trip. Jordan was enjoying fishing, tubing, and even snorkeling in the water! Alex is a typical 15 year old who needs to be kept extremely active and indeed he was throughout the trip. He got to scuba dive, snorkel, rock climb, and jump into the water from rocks 15 to 30 feet high. He was one happy camper! All our sons had a blast hanging around the boat, enjoying the sun, talking with Rachel and Ben, reading, swimming, kayaking, enjoying assorted alcoholic beverages (alcoholic and non alcoholic...Ben is quite the mixologist) and of course going to all the beaches and bars. My daughter enjoyed her time because it gave her an opportunity to smile watching her kids experience activities they loved, read, go snorkeling with her son and have fun enjoying various water and onshore activities. Once she realized how careful Rachel was in preparing menus to meet the different needs of her family, she was able to sit back and enjoy the everything the BVIs has to offer.the and at the same time Relax, because she knew Rachel and Ben had everything under control. She is a professional photographer and her camera was always in use capturing the beauty of the BVIs, the adventures we experienced and wonderful family pictures. While talking about food, I must say Rachel is more than an amazing cook. She always had her ear to the ground about favorite foods we all loved. 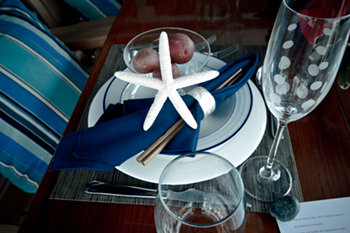 Each meal was a gourmet extravaganza and beautifully presented. She often had delicious surprises for us. When a HUGE plate of magnificent seared Ahi tuna was put on the table for lunch, the ohs and ahs continued til the last morsel of ahi was eaten. My youngest grandson Jordan couldn't believe his eyes when vanilla cupcakes came out for desert and even a special individual apple pie with gluten on the last night for my son in law. When an edible fish was caught everyone was excited to have ceviche at night. We truly all got spoiled by the delicious food starting in the morning for breakfast and ending in the evening with entrees prepped by Rachel or BBQ by Ben. Of course, as we sat under the stars there was always a scrumptious dessert prepared by Rachel to complete the day. I must also complement Rachel & Ben for keeping the Soterion immaculate. They were vigilant about keeping the boat spotless. Don and I have traveled much of the world and I have to say this was definitely one of my most favorite vacations. I already told my husband I want to come back on the Soterion in the near future. After all, what more can parents/grandparents ask for than to watch their family wake up in the morning and go to bed at night with huge smiles having enjoyed the day and knowing the next day was going to be just as much fun. First off, I would like to commend you on your outstanding customer service and fabulous recommendation on our charter. We had a spectacular family vacation and all talked aboard about how great you were to work with. As for Ben & Rachel- From the moment we entered the boat (and even before via phone and email) they made our experience one of comfort, safety and fun. Speaking just for our family of 4 (2 adults and two kids ages 11 & 15), we had several challenges that Ben and Rachel were faced with and they were so wonderful in dealing with it. Firstly, we have several food allergies and a couple picky eaters and Rachel did a great job working with all of these requirements. Not only did she find work arounds for the foods people cannot/will not eat, each meal was a hit. She is a fabulous chef and we told her when she puts out a cookbook we will be first in line to buy it. Our older son is completely the opposite of his brother...the more adventurous the better. Ben quickly recognized this and also found ways to keep him entertained and having a blast. He claims it was the best vacation of his life. He never stopped smiling and was pretty tearful when it came time to leave the boat and head back to school. And as for us parents, well, let's just say that it was the most relaxing and rewarding trip we have ever taken as a family. To have Ben and Rachel bond with our kids and pretty much take over our job so that we can enjoy time relaxing was the best gift ever. 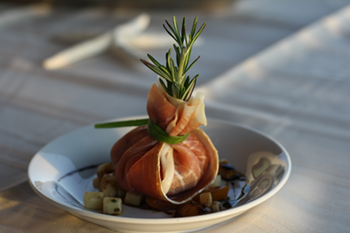 Plus we enjoyed the food, the excursions and the sailing immensely. Overall we can say that Ben and Rachel were amazing. They were organized, structured, loved to educate us (answered endless amounts of questions all day) and took care of our every need from the moment we woke up to the moment we went to sleep. They work really well together and make the whole process seem like a well oiled machine. 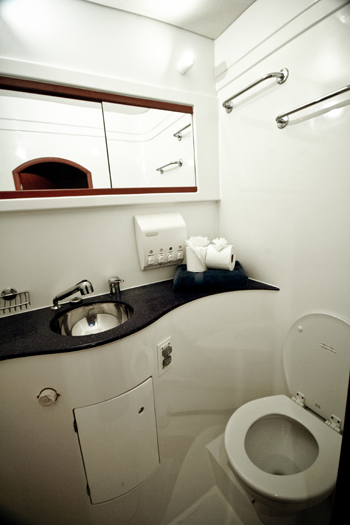 Even when things went wrong, as they are bound to do on a week long trip with that many people aboard, they stayed calm and handled it extremely professionally. Anyone who has them as their crew is extremely lucky. 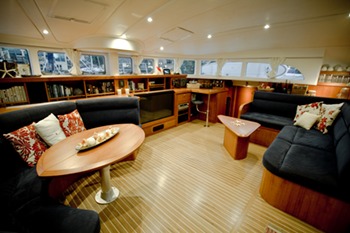 As for the boat itself, it was beautiful, comfortable and perfect size for 8 people. 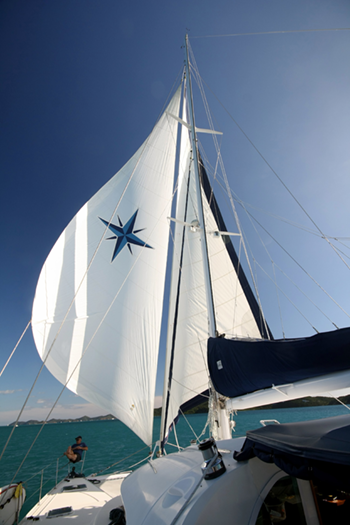 It is well maintained, clean and so much fun to sail. 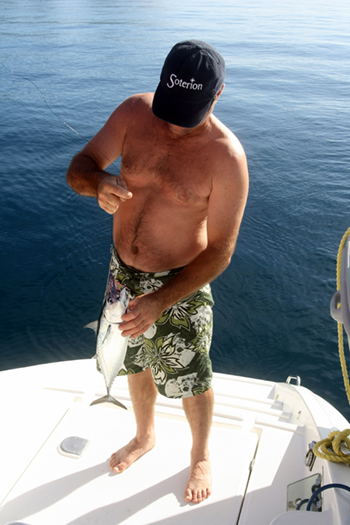 Ben is a talented captain who knows the ins and outs of his boat and the area. I can say that before we boarded, we worried that it was going to be tight quarters for our family, but the opposite happened. The 8 of us had he easiest family vacation to date. Some of that had to do with the boat, but mostly it had to do with the way the trip was organized and all the little things that were noticed and taken care of with each of us every day. Ben put it best in his farewell speech, he thanked us for taking the risk of booking a charter with two strangers and trusting them to make our experience great. He is right, it is a risk, but one well worth taking! Sorry for the length of this email, but I could just go on and on about how wonderful our week in the BVIs was. So thank you again for all your guidance and help in organizing this trip of a lifetime. We hope to be back soon! Our week on Soterion was great! Captain Ben and Rachel made sure that we had a fantastic trip, even though we experienced and worked around a couple of Soterion firsts... the dinghy broke and the water desalinization system went out. The dinghy was sort of a blessing because we ended up renting the mother of all dinghies, and it was an added bonus for the week! While the water system could have been a big deal, we were able to work as a team to conserve enough water to enjoy 2 fabulous days in Anegada before returning to North Sound to fill up. 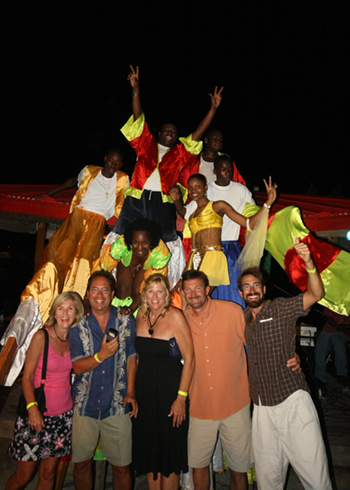 We took advantage of every moment on Anegada! In spite of those two mechanical hiccups, Soterion is beautifully maintained. Ben and Rachel obviously work hard to take care of her! We had 8 adults on our trip, and everyone said that their rooms were comfortable and well-appointed. We were all surprised with how well the A/C works in each of the rooms! 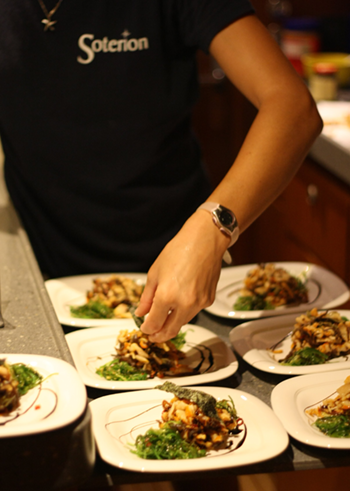 Chef Rach blew us away every meal! Unbelievable how she's able to pull off a gourmet meal, every meal, for all of us... with a beautiful presentation every time!! Can't say enough good things about the menu, snacks, beverages and desserts!!! AWESOME!!! Between the snorkeling, snorkeling and more snorkeling, paddle boards, knee boarding, wake surfing with the hydrofoil, kite surfing, swimming with the tarpon at night, lunch and a couple requested dinners ashore, excursions on Anegada, conch & lobster hunting, a late afternoon at the Baths, yoga on the beach, feeding the tarpon at Saba Rock, the last afternoon on Jost, and SAILING, it was an amazing week! We were able to do things as a group and also had time together as individual couples. Ben and Rachel really care about their guests, and with their knowledge of the islands and great local contacts everywhere we went, they helped make every experience that much more special. Very grateful that you paired us up with them last year!! Darrin and I were delighted to be back on board Soterion with them again this year!! It was a trip that we'll never forget!! Lynne, we also appreciate your help! You're always quick to reply, easy to work with and quite knowledgeable. I've recommended you to quite a few friends and acquaintances. Thank you, Ben and Rachel for another wonderful trip of a lifetime on Soterion! !